ORTON FLEX is a diet supplement from the company Lekam, which supports the work of the joints, strengthen cartilage, tendons and ligaments. It is one of the most recognizable brands in this branch and effectively competes with the market leaders in sales. 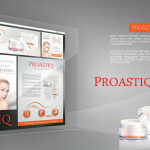 Our company supports the brand Orton Flex visually from the beginning of the product. Long-term cooperation projects resulted in numerous marketing materials and press materials, as well as modern HTML5 presentation for the department representatives.